Most casino art present today are in the form of photographs, and more often than not, these works of art portray only the aesthetics and architecture featured in casinos. Rarely do we find one that focuses on the existing dynamic inside these establishments. 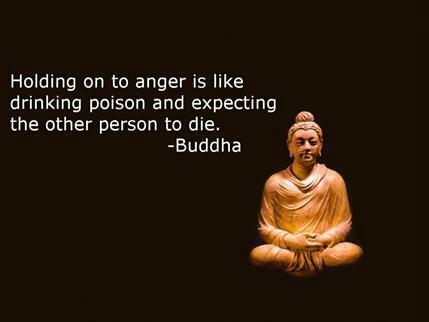 But one artist is bound to change all that. To this day, thousands of painters have lived but only a few influenced the art scene. Picasso’s unusual representation of subjects in three-dimensional form brought cubism and inspired a generation of abstract art. Georges-Pierre Seurat’s pointillism technique is now regarded as among the most influential impressionist techniques among artists. But more than technique and style, art too is a tool of expression. 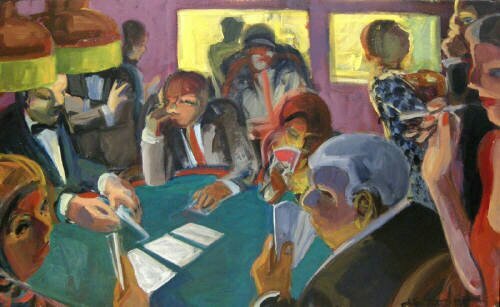 In a male dominated casino industry, one woman took a gamble and found her lucky break in painting subjects found in casinos—Lisa Esherick. Esherick may not be of the same stature as Seurat and Picasso, but she holds respectable status among her peers from the art community. So what makes her casino art special? For the Berkeley artist, the expressive nature of art is the difference maker. “In working with the figure itself, I want to create a range of possibilities for expressive interaction that speaks of the human condition in our contemporary world. Painting is my way of articulating intangible feelings about ways of relating to the world,” says Esherick’s profile in Art Slant. The artist has already experimented with several other topics other than gambling. She has painted a diverse set of scenarios ranging from day-to-day traffic to beach landscapes. However, it was the gambling industry that put her in the spotlight. “Gambling didn’t grab a hold of her, but gambling art occupied the next seven years of her life, taking her to Las Vegas and then overseas to Germany and Russia, where she spent considerable time at the roulette tables,” says a report by Inside Bay Area. Casinos are always open for business, and with the dynamic nature of casino games, it was no surprise that Escherick took fancy of the place. Unfortunately, land-based casinos are competing with the rise of online portals. Casinos and art enjoy a mutual relationship as both try to embrace art and casinos as one. This is because the developers of casino games have begun to see how important visuals are to the success of their games, and they’ve begun employing a variety of art styles in their offerings. From the unmistakably adorable cartoon art of the Pigs Party and Happy Mushroom games on Bubble Bonus Bingo to the realistic renditions of “Grease” and “Titanic”, slot developers are quick to rely on different styles of art to draw crowds in.Meanwhile, Esherick’s art motivates artists to portray casinos in a different light. 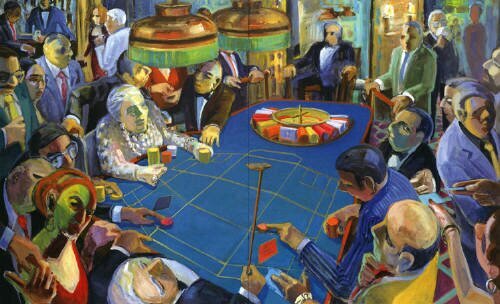 As we find a decreasing number of casino patrons, Esherick and several other artists attempt to immortalize casinos on canvas.